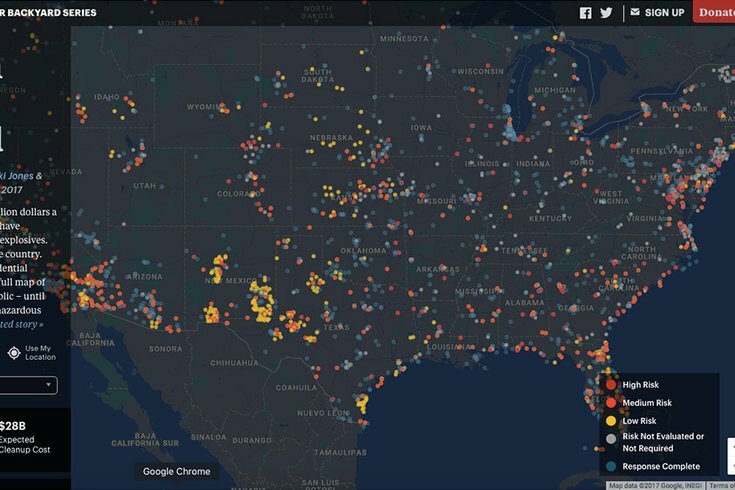 Bombs in your backyard: ProPublica tool maps contaminated military sites across U.S. The military spends more than a billion dollars a year to clean up sites across America that it has contaminated with toxic waste and explosives. ProPublica has developed a full map of the sites that is searchable. At military installations – active and shuttered – across the Philadelphia region there are sites contaminated with toxic waste and explosives. Every year, the military spends more than a billion dollars to clean up sites, which can be found in every state in the country, reports ProPublica, noting that some are near schools, residential neighborhoods and bodies of water. • The former Willow Grove Naval Air Station in Horsham, Montgomery County, where two high-risk landfill sites remain active with soil and groundwater contamination. • Joint Base McGuire-Dix-Lakehurst in Burlington County, where 26 medium-risk sites include landfills, spill sites and unexploded ordinance. • The former Frankford Arsenal in the Bridesburg section of Philadelphia, with a medium-risk multi-use range with explosives and munitions. • The Nike site in Media, Delaware County, where PCE contamination in groundwater is a medium-risk site. Cleanup at many sites will continue for decades, according to Department of Defense data. For the first time, ProPublica has developed a searchable map of the sites. Just type in an address to see all the sites near your home or workplace. Or search all the sites in a specific state.